A superlative hotel room view, of course, starts with the hotel itself having a superlative location. And the InterContinental Thalasso most certainly does. It’s nestled alongside a lagoon on Motu Piti Aau (motu being the local word for a “small island,” piti aau meaning “two hearts”). 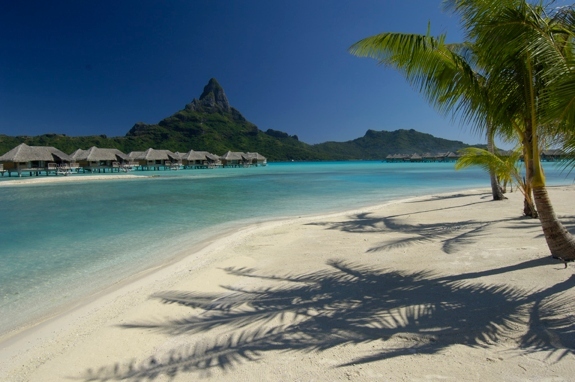 From there, the stunning vista across turquoise waters to Mount Otemanu and the lush island of Bora Bora is the stuff of screen savers. 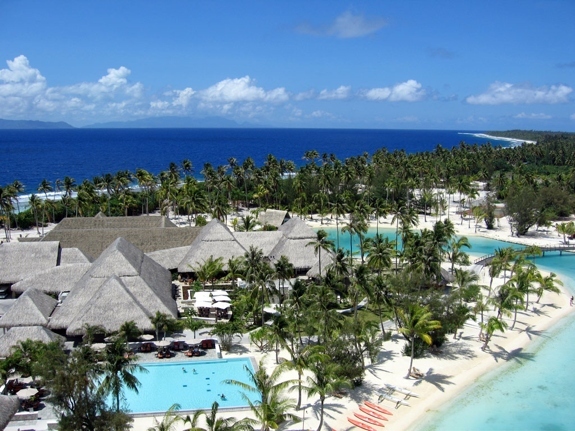 The InterContinental Thalasso, though, isn’t the only luxury resort on Motu Piti Aau. 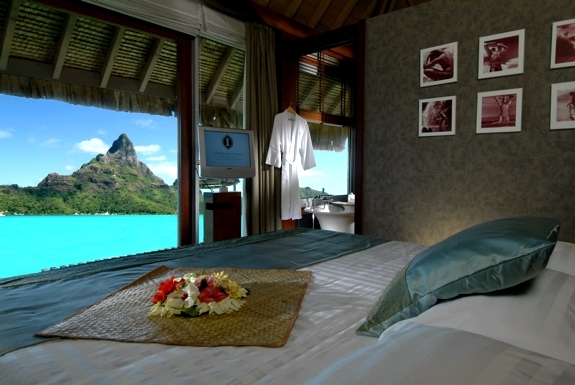 But it is the only one to have overwater bungalow suites with floor-to-ceiling windows in the bedroom. This means that guests can wake up, rub their eyes and find them focusing upon some of the most glorious nature in the whole of the South Pacific—all before setting foot outside their luxe linen bed. 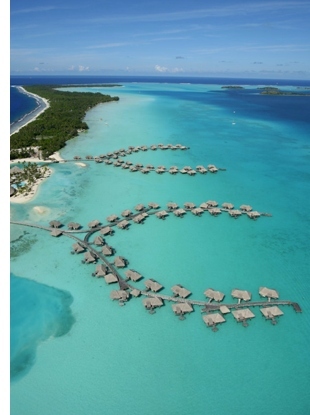 Another superlative feature of the InterContinental Thalasso: It’s eco-friendly. Truly so. 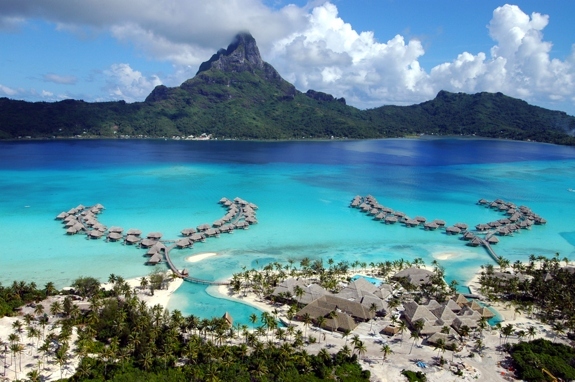 While many other resorts seem to be committed to the environment only to the extent that it makes for good marketing, the InterContinental Thalasso goes through great lengths to genuinely reduce waste and limit their carbon footprint. 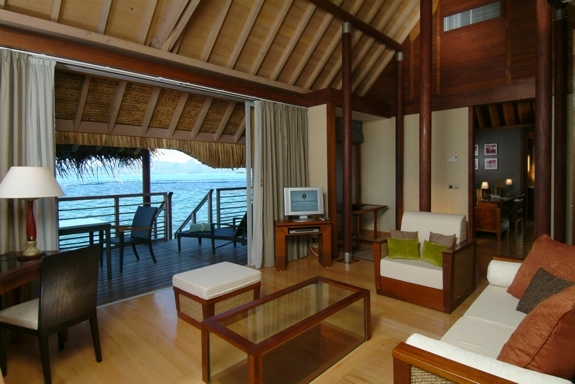 The centerpiece of the resort’s eco-orientation is its air conditioning system. The resorts A/C runs entirely on cold water that’s funneled through the world’s deepest ocean pipe. That system produces no greenhouse gases, saves about 2.5 liters of fossil fuels every year and cuts out resort’s electricity consumption by 90%. Among it’s other environmental initiatives, the InterContinental Thalasso reuses the pool water to irrigate plants, composts 100% of it’s food waste, uses green cleaning products, runs several resort functions entirely off of solar electricity and, instead of importing the salt for use in its spa treatments, the Thalasso distills the salt from local ocean water. 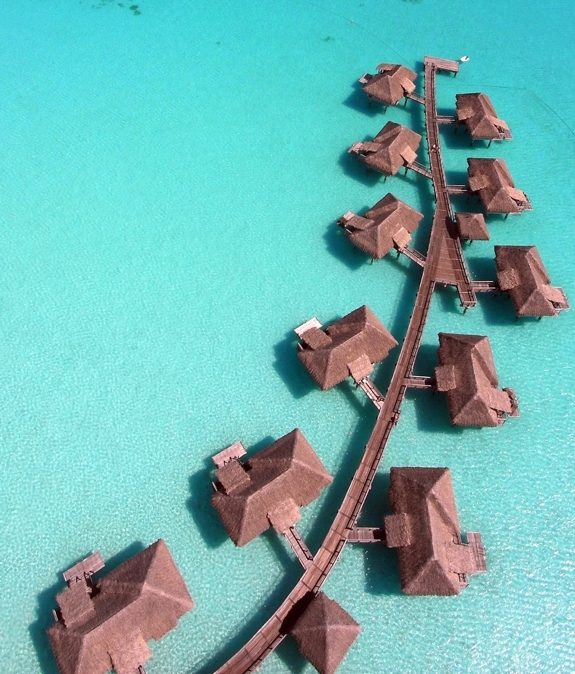 Granted, none of that has any direct bearing on the room views you’ll be treated to at the InterContinental Bora Bora Resort and Thalasso Spa. But there’s something nice about looking out upon ecological beauty while knowing you in a resort that’s helping to preserve it. 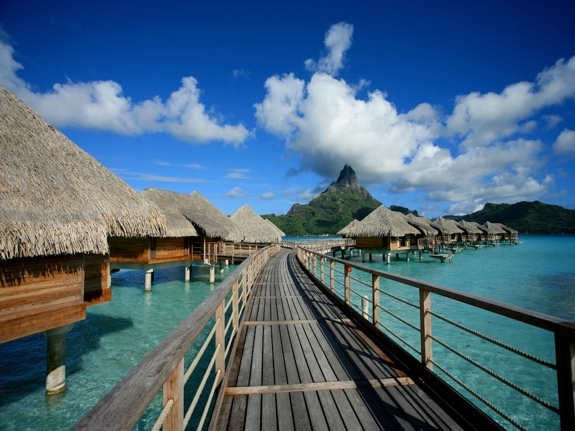  Note that the InterContinental Bora Bora Resort and Thalasso Spa is not the same property as the InterContinental Le Moana Bora Bora. 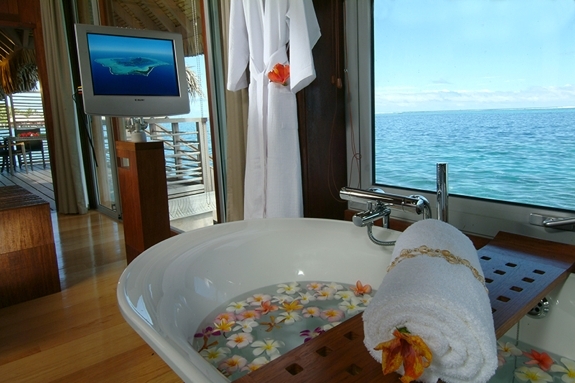 InterContinental runs a free boat shuttle between the two and guests at one resort can use the facilities at the other.  The innovative Sea Water Air Conditioning System (SWAC) was the idea of famous Godfather Don and frequent Thalasso guest Marlon Brando. 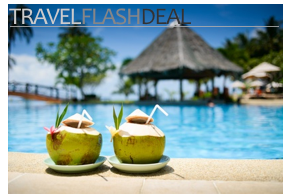 The Thalasso was the first hotel in the world to have such a cooling system. Though an enormous capital expense, the system worked so well that it paid for itself in less than eight years. Based on that success, other resorts and communities have since built their own SWAC. Great place to visit having a grand vacation with my family here is really great..Thanks for sharing..
Ok, you win. 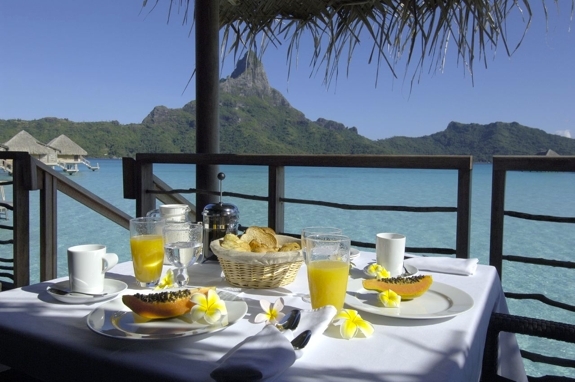 You made me really really want to eat, breath, and live this resort. Mine mine mine!